This has been quite a year of life changes; death, cancer, addiction, health challenges, job changes and financial worries have touched me, my family and friends, along with great love and new life, hope and possibilities. I am expanding my horizons, focusing on working in Hawaii this winter, yet sad to let go of Baja. No wonder anxiety has been interrupting my sleep! Yesterday, after another sleepless night, I forced myself to get some computer work done (Hawaii is not knocking on my door- go figure! ), and do yoga (keeps me sane), despite the sunny, crisp, beautiful autumn day calling to me, bargaining that I’d go out for the sunset. I drove to my favorite overlook on the south end of the island, feeling a bit melancholy that my time on these waters was probably over until next spring, when I felt the urge to go to the west side, I had a feeling whales might be there, even though my mind said no. 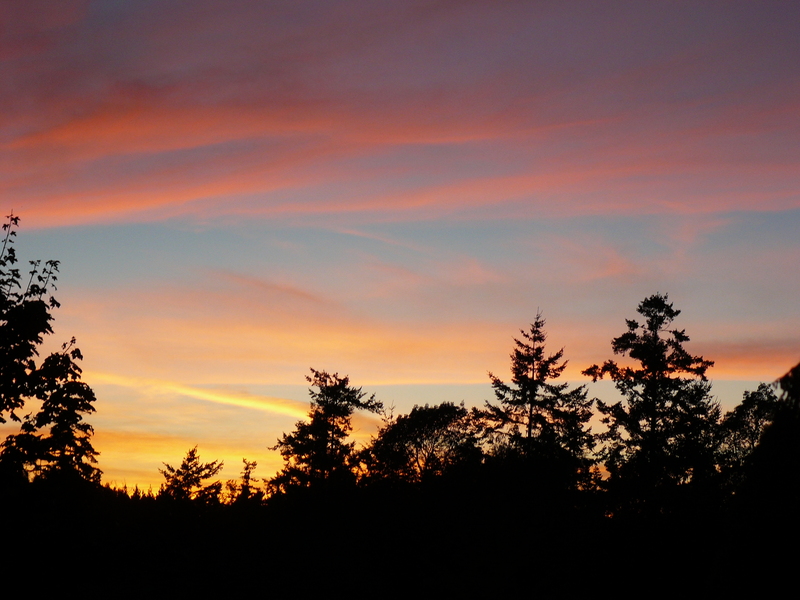 I chased the sunset to the west side, and as I came out of the tree line there were Orcas! spread 1/8 of a mile off Land Bank property out into Haro Strait. I resisted the urge to jump out of my car right in the middle of the road, parking safely at the first pull out. I was totally absorbed and awed watching a dozen? or more groups of killer whales swimming south with the ebbing tide, backlit by a salmon colored waning sunset reflecting in the low clouds and on the still water. I tried to take a few pictures, couldn’t seem to get focus, put the camera down to just enjoy the experience. For about a half hour pectoral slaps, tail lobs, and breaches sounded off the water. I could identify J-26 Mike (my favorite teenage whale! ), and J-1 Ruffles, when they slowed to forage a bit in a reef off of Hannah Heights. The amount of whales suggested some K’s and/or L-Pod whales too, but I couldn’t get any ID’s. Meanwhile, I noticed a friend that I’d lost touch with, hadn’t seen in months, sitting right there on a log, enjoying the magical evening too. She said she had just mentioned me to her friend, wondering about a whale behavior. They’d seen a couple of the whales speed swimming- ‘porpoising’ to catch up with the others. We hugged and agreed how ironic the evening was, and we were the only people (that we could see) witnessing this spectacular encounter! Today, all around the world, people are celebrating the fantastic survival and rescue of the Chilean miners. The effort shows the best of humanity. P.S. Just found out through the Orca Network that L-82 Kasatka was sighted with a new calf- L-116, October 13, 2010, by The Center for Whale Research!! I like to think they were out there on that awesome evening! We don’t have Orcas and other whales in MN. but I do share in your love of all things in nature and the peace that it brings to me to observe.